Cape Town - Proteas skipper Faf du Plessis said a couple of weeks ago that "12 or 13" of the men who will be going to the World Cup in England next year have been locked in. The skipper added, however, that there would always be room for a couple of players who enter that tournament in "red hot form". Reeza Hendricks, even if not part of the strongest South African XI currently, is probably one of the players Du Plessis was referring to when he spoke about those who had already punched their tickets to England. Before the recently-completed tour to Australia, Du Plessis suggested that it was a "straight shootout" between Hendricks and Aiden Markram for the No 3 berth in the ODI side. Markram may have edged ahead slightly in Australia, but when talking about 'red hot' form there is nobody in the country that can compete with Hendricks right now. 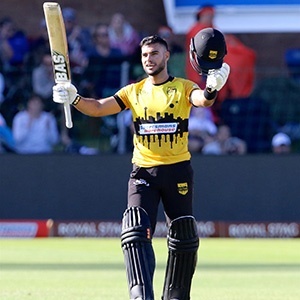 Having opened his Mzansi Super League (MSL) account for the Jozi Stars with a duck against the Cape Town Blitz on November 24, Hendricks has turned it on since then to race to the top of the run scoring charts. Scores of 55 (48), 104* (51) and 108* (62) against the Tshwane Spartans, Durban Heat and Nelson Mandela Bay Giants, respectively, have put the 29-year-old very firmly in the spotlight. Perhaps most impressive is the way Hendricks went about his business in those knocks. His strike rates, particularly in his last two innings, suggest that he was going hell to leather. A closer look at Hendricks' approach, though, reveals that he relied on nothing more than intelligent, well-executed cricket shots to score his runs. It was refreshing to see in the sometimes-frantic world of T20 cricket and batting, in particular. Markram has also found a touch of form, with scores of 50 (39) and 48 (39) his last two contribution for the Paarl Rocks. As the World Cup nears, however, perhaps this battle is not only about Hendricks and Markram and the No 3 spot. Veteran Hashim Amla, expected to open the batting alongside Quinton de Kock in England, was dropped from the Durban Heat side that lost to the Rocks on Sunday. He hasn't had many of them in what has been one of the great South African careers to date, but Amla is experiencing a lean run. His MSL scores this season read: 15, 24, 12, 0 and 4. He was injured for South Africa's tour of Australia, but his scores in his last 5 knocks in the Caribbean Premier League also paint a picture of tough times: 15, 3, 2, 35 and 3. The general feeling with Amla is that he will not be down for long and that a return to form and big runs is around the corner. There is certainly enough cricket to be played (5 ODIs against Pakistan and 5 against Sri Lanka) between now and the World Cup, and Amla finding his feet before then will be high up on the list of priorities for Du Plessis and the Proteas brains trust. But if, for whatever reason, that does not happen, then Hendricks is looking more and more the type of player who can be backed alongside De Kock. He, like Markram, is flexible enough to either open or come in at No 3 or No 4. While it may make selection difficult, having players in form is nothing but good news for South African cricket in an effort to win a first ever World Cup trophy. There is obviously still a long way to go, but that means that there is enough time left for players to make themselves indispensable to the national cause. With two classy centuries in just three days, Hendricks is well on the right track to doing just that. He will next be in action on Tuesday when the Stars take on the Blitz at Newlands. Who are you backing in this year's Mzansi Super League?